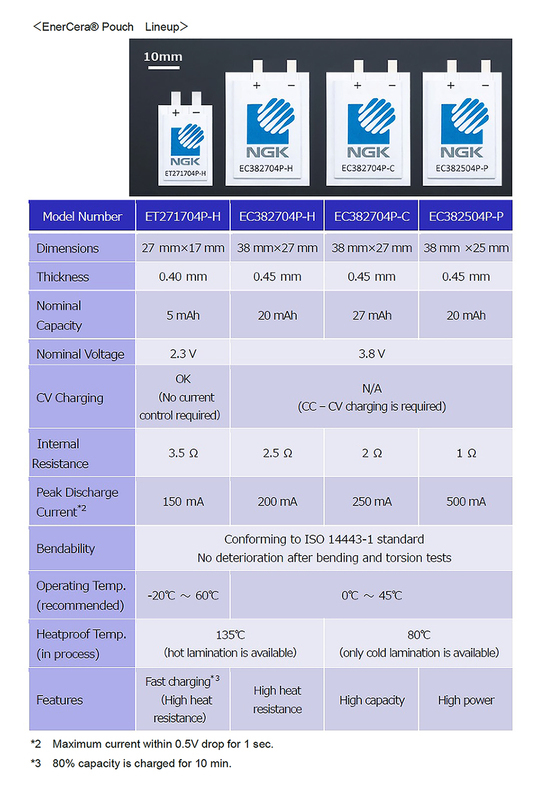 NGK INSULATORS, LTD. (hereinafter "NGK") announced on November 8 that it has developed the small, thin and high-energy-density ceramic secondary battery “EnerCera (R)” series successfully. Mass production will start in April 2019 to be adopted as a power source of “IoT; everything connects to the internet” devices, smart cards and so on. EnerCera is a Li-ion secondary battery with NGK’s original Crystal Oriented Ceramic Plate as electrodes. The Crystal Oriented Ceramic Plate is composed of just an active material and it contains no organic binder or conductive material which exists in a Li-ion battery normally but does not contribute to battery capacity. Therefore, EnerCera realizes high energy density and low internal resistance with a small and thin body and is capable of high-temperature installation. The energy density is double and the internal resistance is less than a half (*1) compared to commercial secondary batteries of the same size. 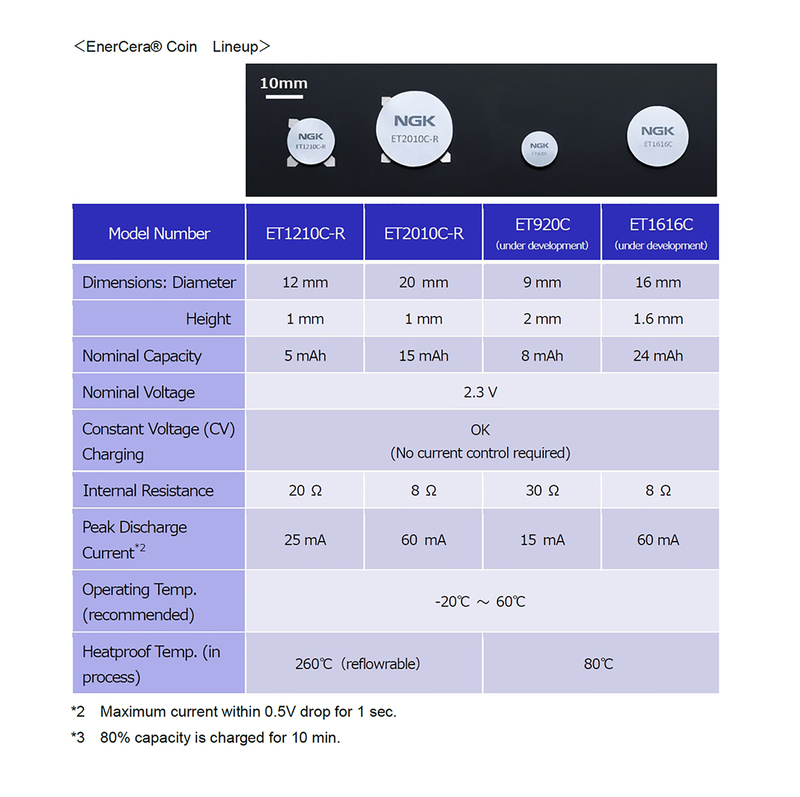 Therefore, EnerCera is an ultra-small/ultra-thin onboard-type high-performance battery for operating ICs, sensors and a wireless communication system which needs large current such as several 10 mA to several 100 mA. In addition, CV (Constant Voltage)-charging capability eliminates the need for a charger IC to control the charge current. EnerCera has two types: “EnerCera Coin,” a coin type cell, 1 mm to 2 mm thick, for mounting on a circuit board, and “EnerCera Pouch,” an ultra-thin and bendable cell, 0.4 mm to 0.45 mm thick, for embedding in a card. EnerCera Coin is the world’s first (*1) SMD (surface mount devices)-type Li-ion battery which can be mounted by Solder Reflow, commonly used as an electronic component-mounting process, and it has a high discharge current property sufficient to operate devices. EnerCera Pouch is the world’s first (*1) thin-type Li-ion battery which can be embedded by hot lamination (above 100 degree Celsius) used widely in the IC card production. The EnerCera Pouch lineup has a fast charging type, a high-capacity type and a high-power type for customers’ various device designs. 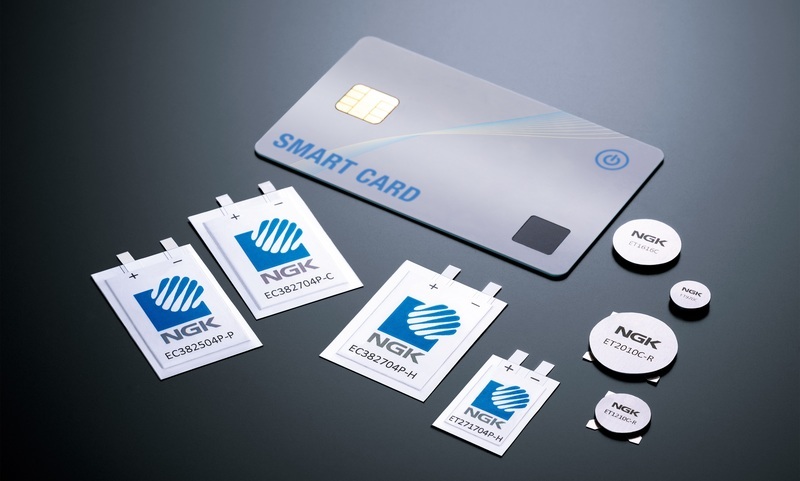 The EnerCera series is expected to be adopted for applications which require high capacity in a small and thin body, such as IoT devices, beacons (short-range wireless communication devices), RFID tags, electronic shelf labels (ESLs), wearable devices, solar watches and backup power of solid state drives (SSDs). NGK has provided EnerCera samples to tens of companies worldwide. The production lines are ready, with 2 million units per month, at NGK’s Nagoya factory and NGK Ceramic Devices Co., Ltd.’s Yamanashi factory. NGK plans to start mass production in the spring of 2019. NGK will exhibit EnerCera at "IDTechEX Show!" to be held in Santa Clara, USA, from Wednesday, November 14, to Thursday, November 15, 2018. The contents are at the time of this press release. Since it is a product under development, contents may be changed without notice. NGK is the world’s largest manufacturer of electrical insulators, including 1,000-kV ultrahigh-voltage (UHV) transmission and substation insulators, and has a 100-year history. With foundations in exclusive ceramics technology, NGK contributes to environmental conservation, providing a wide range of products and technology in the “Triple E” growth fields of energy, ecology and electronics. NGK is also one of the largest manufacturers of HONEYCERAM and diesel particulate filters (DPF) for catalyst converters for automobiles. NGK is also the world’s leading manufacturer succeeding in commercialization of large-capacity energy storage systems (NAS batteries), which has overturned the conventional wisdom that power cannot be stored.